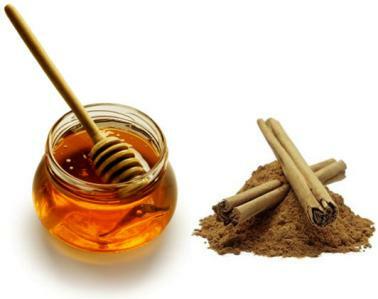 By themselves or in combination, honey and cinnamon are excellent for dogs. Still, when in combination, they are more potent and can help to alleviate pain and inflammation to a certain degree. They aid in the digestion of your dog’s food and can help settle stomach upsets also. Turn dough onto lightly floured surface, and knead gently. Roll dough out to about ¼ inch thickness and using a cookie cutter of your choice, or a sharp knife, cut out shapes. Place cut-outs onto cookie tray and bake for 15-20 minutes (depends on your oven). When done they should appear lightly browned around the edges. Remove from oven, place cookies on to a wire cooling rack and allow to cool. When cooled, store in a zip lock bag or an air-tight container. These Cinnamon and Honey treats should keep for about 7 days, anything that’s not going to be eaten in 5 – 7 days, it’s a good idea to refrigerate or freeze them for longer shelf life. They can be frozen for up to 4 months. Feed these Cinnamon and Honey Treats as a treat. Studies have proved Selenium to be a powerful anti-cancer and anti-aging agent. Research has demonstrated that Sunflower seeds also help improve a dog’s skin and coat. Chia seeds have some incredible effects on animal health. The seeds contain large quantities of protein, Omega oils, 3 and 6 plus they have five times the calcium of milk. There are no known allergies in dogs to Chia seeds. Note: Replace with 5 cups plain (all purpose) flour if you prefer. Mix dry, then wet ingredients until lumpy. Add extra water, one teaspoon at a time as needed. In the bowl and using hands, knead until dough holds together and a ball forms. Transfer to lightly floured surface. 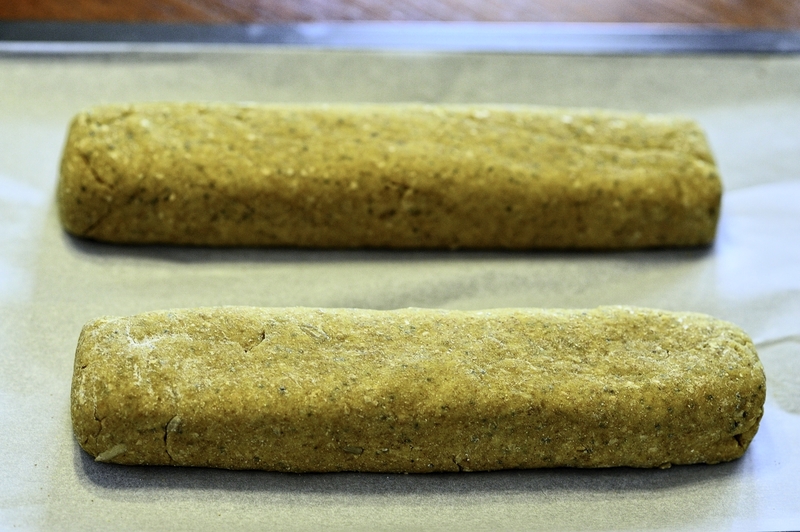 Divide dough into two equal pieces and shape each piece into a log. Flatten the logs to about 2 inches wide and around 1½ – 2 inches high. Place about 4 inches apart on baking tray. Bake for about 40 minutes, or until firm (depends on your oven). Remove from oven and let sit for 15 – 20 minutes. Slice into ½ – ¾ inch slices. Return to baking trays and bake for 15 minutes – remove trays from oven, turn slices over and return to the oven for 15 minutes, until golden. 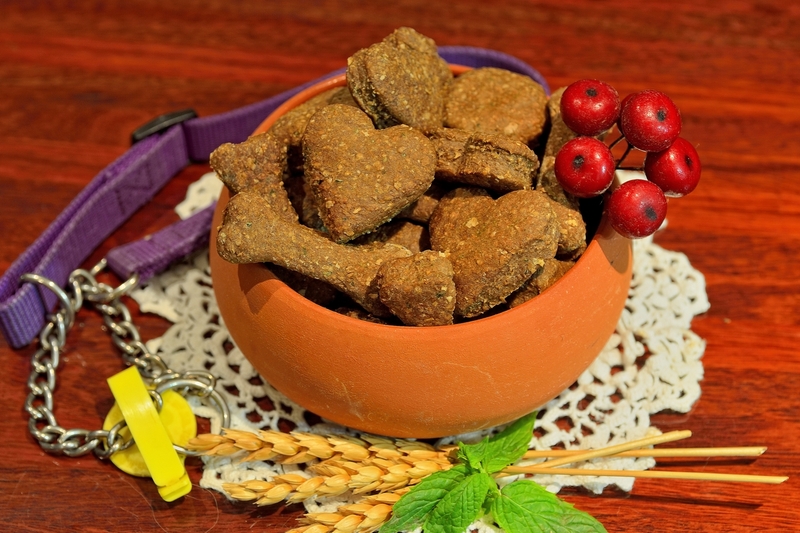 Homemade dog treats do not contain preservatives like the store bought ones, anything not eaten within 5 – 7 days is best refrigerated or frozen. 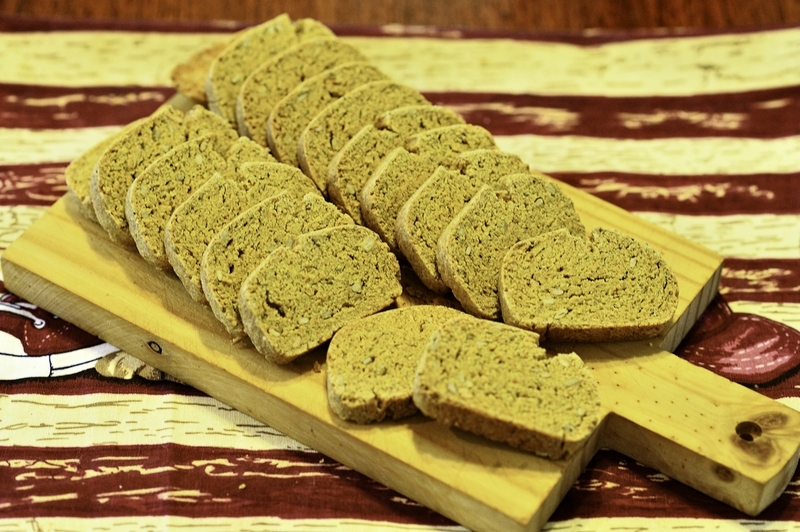 These Doggi Biscotti can be frozen for up to 4 months – if they last that long! Yield was about 46 slices. 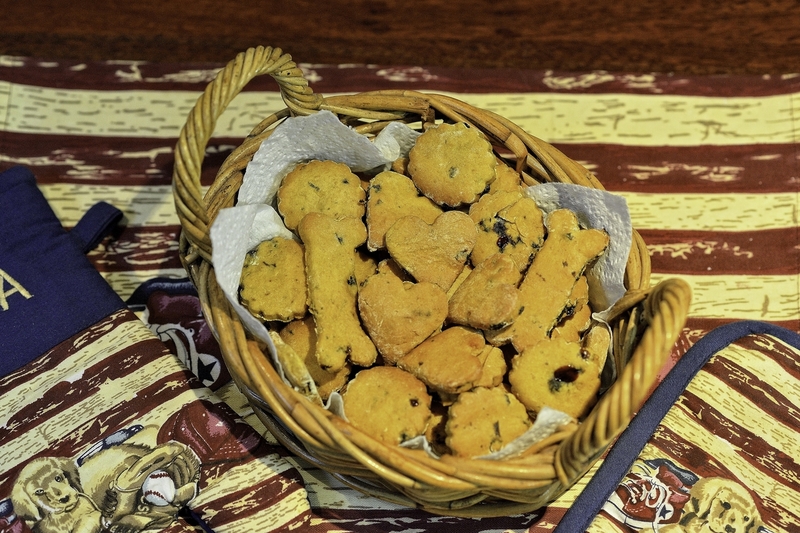 Feed these Doggi Biscotti as a treat. Treats should not make up more than 10% of your pets diet. Preheat the oven to 165° C (325 F°) and line baking tray with parchment paper. In a large mixing bowl, beat together the pumpkin, peanut butter and honey. Add the flaxseed meal and mix thoroughly. Add in the chickpea flour ¼ cup at a time and continue mixing until dough forms. Add in the hydrated blueberries and gently fold in to combine. Lightly flour a work surface and rolling pin with some chickpea flour. Turn mixture on floured surface and gently bring together with hands. Continue to work the dough until you can roll it out to about ¼ inch thickness. Using a small sized cookie cutter, dip cutter into chickpea flour and cut out shapes. If you don’t have a small cookie cutter, just cut the dough into little squares with a pizza cutter or a sharp knife. Continue working, rolling and cutting until all dough is used. Place cookies on the cookie sheet and bake for about 10-15 minutes, depending on your oven. Cool completely and then store in an airtight container for up to a month. I like to store these in the refrigerator so they stay fresh. Makes about 36 doggie cookies using a 1 inch diameter cutter, perfect treat size! Feed these Blueberry Peanut Butter Cookies as a treat. Blueberries – antioxidant powerhouses (blueberries contain anthocyanins and phenolics that act as antioxidants). Antioxidants in blueberries have been shown to slow the aging process and reduce the risk of cancer. Researchers at Tufts University have given blueberries the highest rating of all foods tested for their capacity to destroy free radicals. Blueberries also contain beta-carotene, vitamin C and vitamin E.
Flaxseed Meal – full of Omega 3 fatty acids, excellent for your dog’s heart, skin and fur. It turns out PUMPKIN, a faithful addition to pies, soups, and cakes, works a certain enzyme magic on stomach irritation in dogs. Another interesting fact, PARSLEY is great for your dog’s breath. Preheat oven to 180° C (350° F) and line a cookie sheet with parchment paper. In a large bowl, whisk together eggs and pumpkin to smooth consistency. Stir in dry milk, and any or all of optional ingredients. Add flour gradually, combining with spatula or hands, to form a stiff, dry dough. Turn out onto lightly floured surface and knead lightly until mixture comes together smoothly. Roll dough to ½ inch thickness (it will probably split around the edges of the dough – don’t worry too much, all the dough gets used). Cut using the cookie cutter of your choice. Gather left over dough (edges and scraps) and knead together lightly. Roll dough again and continue to cut out shapes, repeat this process until all the dough is used. Place shapes on the paper lined cookie sheet. If desired, use tines of fork to decorate, lightly pressing down to only halfway through dough. Bake 20 minutes. Remove from oven and carefully turn biscuits over, then return to oven and bake an additional 20 minutes. When cool, store in zip lock bag or air-tight container. Keep in refrigerator for longer shelf life, or store in your freezer for up to 4 months. Feed these Pumpkin Cookies as a treat. These treats are made from thin strips of chicken, slow baked to almost the point of crispness. 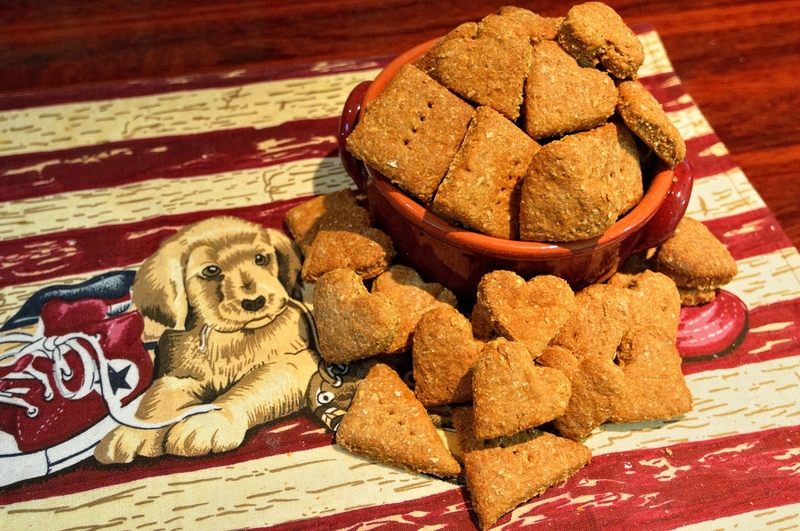 All NATURAL, they are A HEALTHY TREAT for your loved pet. 2 – 3 chicken breast fillets and 2 – 3 tenderloins (I use free range antibiotic free, organic). Rinse the breast fillets and tenderloins under cold water; pat dry and clean by removing any excess fat and sinew. To make cutting easier, I place the chicken breasts and tenderloins in the freezer for around 30 minutes … it’s so much easier to slice. I slice mine thinly and as even as possible, but you can decide how thick you want yours to be. Keep in mind, the thicker the slices, the longer they are going to need to dry in your oven. Preheat your oven to 120° C (250° F.) Line two shallow baking trays with parchment paper (good for catching any drips) and place a wire rack over, on, or in, each baking tray. Place the sliced chicken strips in an even layer across the wire racks, making sure they don’t touch each other. There needs to be a little space between each piece of chicken, so air can flow between them and around them while they are drying out, this helps the dehydrating process. Place the trays on the lowest rack in your oven. Thin, even sliced chicken strips should take about 2½ – 3 hours in your oven, but as ovens differ, check the strips after about 2 hours. To check: Using kitchen tongs, take one strip out and check to see if there are any light patches. If there are light patches, it means the chicken is still moist, so you will need to put the strip back in the oven for another 30 minutes. You may need to repeat this process one more time, you want NO light patches, NO moisture at all. When properly dried, the chicken will be the same color all over. Once done, remove the trays from the oven, and leave them to cool. When cool, you can store them in sealed containers or zip-locking bags. If the treats aren’t going to be eaten within 7 days, store them in your refrigerator, for a longer shelf life. 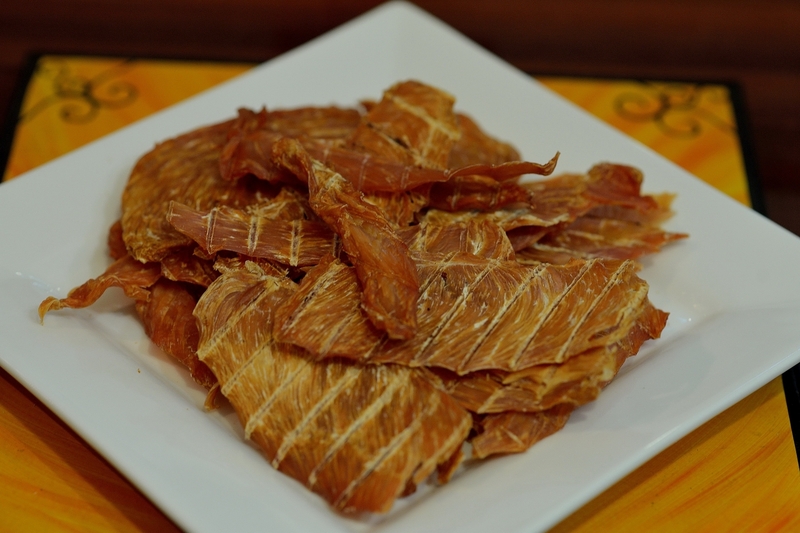 Feed these Chicken Jerky Strips as a treat. Did you know MINT is an excellent anti-depressant for your dog…. Combine all ingredients in food processor, process until well mixed, mint is chopped, and a large ball forms. Press or roll out onto a non-stick surface to a thickness of ¼ -½”. Cut with bone-shaped cookie cutter and place on non-stick cookie pan. 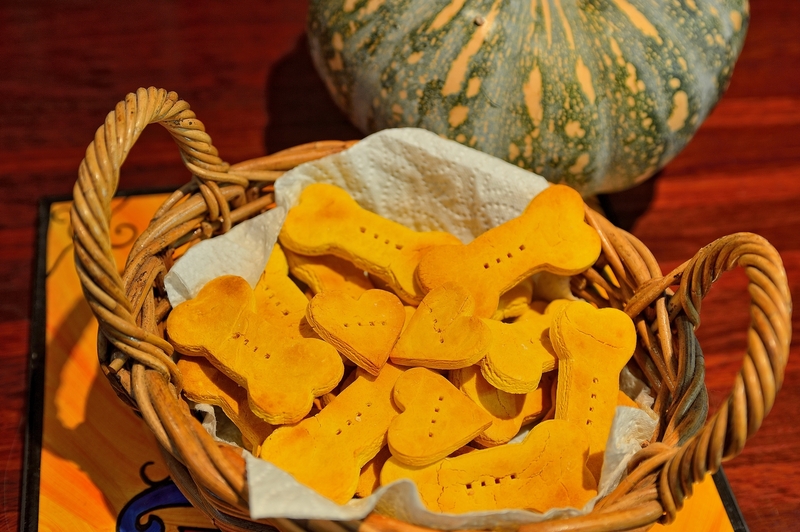 You’ll love making this sweet potato dog chew recipe for your dog because sweet potatoes are loaded with beneficial antioxidants and nutrients. They are rich in Vitamin A, C and E, Vitamin B1, B2, B3 and B6, Calcium, Iron, Magnesium, Phosphorus and Potassium. They also contain valuable anti-inflammatory nutrients, and are classified as an anti-diabetic food. 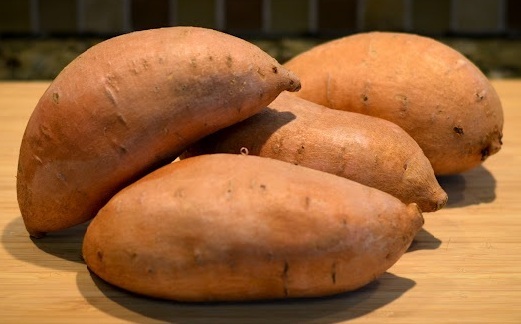 They received this title because animal studies have found that sweet potatoes help stabilize blood sugar levels and lower insulin resistance. Cut off one side of the sweet potato lengthwise, as close to the edge as possible. Cutting the side of the potato first allows you to then turn the potato onto this flat surface that you have just created. Having a stable area to rest the potato will make it easier to cut the potato into slices. Don’t discard that first piece, it comes out just as yummy as the rest! Cut the rest of the potato into slices, no smaller than 1/4″. Place them on the prepared baking sheets. Bake for 3 hours, turning over after 90 minutes. (Baking for 3 hours results in a soft, but chewy dog treat. If your dog prefers more of a crunch, then bake for an additional 20-30 minutes). When you take the sweet potatoes out of the oven, they may at first appear to be too soft. Let them cool completely on a wire rack before you decide whether or not to bake them longer. This is because they will continue to dry or harden while cooling. Storing – Although these treats are dried, you will want to keep them in the refrigerator for up to 3 weeks. You can freeze them for up to 4 months. Feed these chews as a treat. Feed a 1 to 2 inch portion per 4.5 kg (10 lbs) of body weight. Treats should not make up more than 10% of your pet’s diet.